Carpal tunnel syndrome (or CTS) is one of the most common types of nerve-related injuries among both men and women, with as many as 10 million people in the U.S. suffering symptoms like pain, numbness, and weakness. While the symptoms may be uncomfortable, the good news is, CTS is very treatable. The key to finding fast, long-term relief is to see a doctor at the earliest sign of symptoms to prevent more serious issues from developing. Carpal tunnel syndrome is a condition that occurs when a nerve (called the median nerve) in your forearm becomes squeezed or compressed where it passes through your wrist. 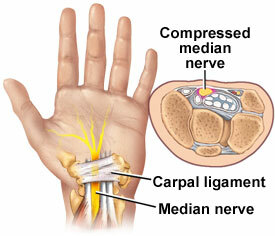 The median nerve provides sensation to part of your hand and fingers, and it also helps your hand flex and grip. The symptoms of CTS can range from mild to severe, and they can occur intermittently or continuously, depending on the extent of the underlying damage, your activities and other factors. In most mild to moderate cases, carpal tunnel treatment involves rest, splinting, gentle stretching exercises and over-the-counter pain relievers. The goal is to help reduce the inflammation in the area so the nerve is no longer compressed. Sometimes, injections of steroid medications are used to reduce swelling when these other options don’t work. In some cases, surgery may be recommended to “widen” the carpal tunnel and relieve compression in the area. The surgery used to treat carpal tunnel syndrome is sometimes called carpal tunnel release. During the procedure, the surgeon makes a very small incision near the wrist, then carefully cuts the ligament that stretches over the top of the “tunnel,” relieving pressure on the median nerve. The procedure can be performed using an “open” technique,, or endoscopic technique. The endoscopic technique, uses a slightly smaller incision and a special instrument called an endoscope to “see” inside the wrist area. Carpal tunnel release surgery is performed on an outpatient basis, and it often can be performed using local anesthetic avoiding the need for general anesthesia. Your wrists and hands are very complex, containing dozens of bones, ligaments, tendons, nerves and other structures, and continual or recurrent pain or other symptoms in your fingers, palm or wrist is your body’s way of telling you something’s not right. Don’t ignore those signs. The best way to relieve painful symptoms and prevent more serious complications is to see your doctor at the first sign of discomfort. As a leading hand and wrist specialist in the greater Chicago area, Dr. Brian Bear helps patients in Illinois, southern Wisconsin and western Iowa, understand the causes of hand pain and get the care they need to feel better. To find out more about hand and wrist pain and to learn how specific issues are treated, call OrthoIllinois at 815-398-9491 and schedule an appointment with Dr. Bear today.